Unfortunately time constraints (i.e my day job) keep getting in the way of me updating this site so all Ive been able to do so far for the Grimsby Town Nickname page is a very basic bit of background. 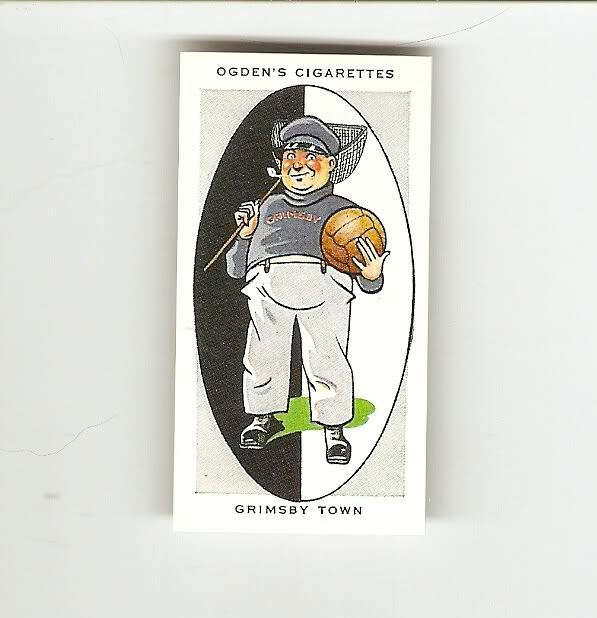 Ive shown below a football cigarette card from the Ogdens AFC Nicknames series that features a Fisherman with a football which of course depicts Grimsbys "Mariners" nickname !! "As representatives of one of the chief fishing ports in the country, Grimsby are known as the “Fishermen” and they play before one of the most enthusiastic crowds in the country. They have spent most of their time in the Second Division since they joined it in 1892. On two occasions they have gained promotion, but unfortunately they were not able to retain their senior rank for long. They fell out of the First Division at the end of season 1932-32. In this season Bestall, their clever little inside forward, played for the Football League. Coleman, the Arsenal centre forward was formerly a member of the side". So there you are, a very brief overview of Grimsby Towns nickname, obviously theres a bit of confusion whether its "The Fishermen", as the card suggests, or "The Mariners" as they are know now. I dont think it takes too much imagination to figure out whats happened there but I will come back to this page and expand on it shortly.